-Self-Sustenance: Super Sonic doesn't need to eat, sleep or breathe in this form. Super Sonic can survive in the vaccuum of space. -Positive Aura: Mn ability to turn people possessed by some evil force back to normal. Translation Device: While Sonic was adventuring in outer space, he was implanted with a device allowing him to understand all languages (including those of 'regular' animals) with Un ability. Sonic the Hedgehog first transformed into Super Sonic when a rampaging robot known as the Universalamander ran havoc across Robotropolis and into the Great Forest. Realizing he was outmatched, Sonic quickly gathered the 7 Chaos Emeralds and 50 Power Rings needed to transform into Super Sonic. He quickly made short work of the roboticized beast, having quickly taken a shrinking device Rotor devised and shrank him to the point where he wasn't a threat anymore. Though Chaos Emeralds would come into play in later stages, Sonic would not take this form again until Sonic and Sally discovered a hidden Zone near a special lake. Taking advantage of it, Knuckles, who had learned of this Zone through a special book, dove into the Zone, seeking to take its Emeralds and rings so that he could help keep the Floating Island airborne should something happen to the one Emerald on the island. Not wanting to be outdone, the two rivals went at it, both of them turning Super Sonic and Hyper Knuckles and destroying the Zone in their fight. When Mammoth Mogul stole Enerjak's power and became Master Mogul, it was Athair who allowed the two former rivals, as well as Tails, to take their Super forms to defeat the would-be tyrant and seal him within the Master Emerald. When a weapon by Dr. Eggman, still as Robo Robotnik, used a weapon to throw the citizens of Knothole in reverse due being caught in the 3-hour zone shift, Sonic strapped on a Super Emerald and raced across Mobius, taking his various transformed states until the beam struck him, the Super Emerald turning his quills dark blue, his head quills longer, giving him green eyes and adding buckles and soles to his shoes. During the Chaos incident in Station Square, when Chaos absorbed the Chaos Emeralds to become Perfect Chaos, Sonic took the remains of that energy to become Super Sonic, using the aura of the Chaos energy to soothe the beast as Knuckles and the Freedom Fighters fought to help stop Chaos and save the citizens. When Sonic was tossed into space after the Xorda Attack on Mobius, a variation of Super Sonic was created and forced to do battle with the real Sonic. 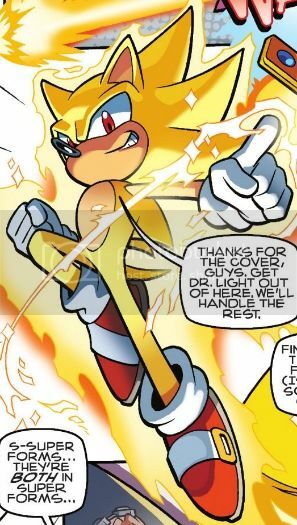 Super Sonic was not summoned again until The Great Harmony, when A.D.A.M. gathered all of the Chaos Emeralds from the universe. Sonic and A.D.A.M both decided to utilize their super forms to stop each other. While they fought, Super Shadow and Turbo Tails sent all of the Emeralds into the Zone of Silence. Then Tommy Turtle, whom A.D.A.M. had possessed, sacrificed himself to destroy A.D.A.M. despite Super Sonic's protests. Sonic transformed once again into Super Sonic during the return of Enerjak. Although this could have been prevented, Dr. Finitevus let Sonic transform as he expected the Hex he placed on the Master Emerald to corrupt Super Sonic as well, though the Hex had no effect on Super Sonic. Following this, Super Sonic battled Enerjak until Locke sacrificed his life to remove the Hex, restoring Knuckles to normal.